Graham is our guide through the series. One of the Ten Threats to the Great Lakes is the decline of many of the native species. 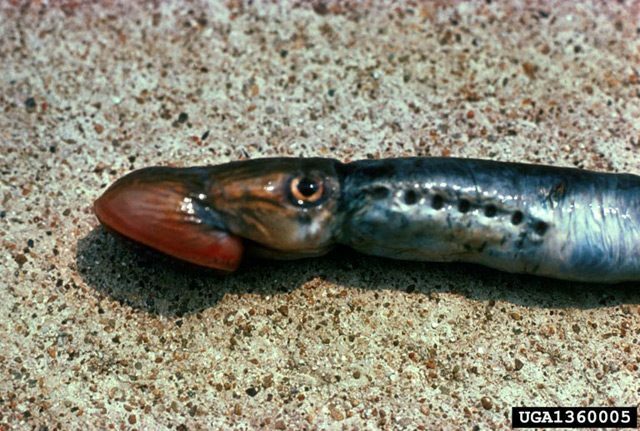 to keep the invasive sea lamprey under control. ago. The slimy parasites attach themselves to big fish and feed on them until they die. Each lamprey can kill 40 pounds of fish in its lifetime. 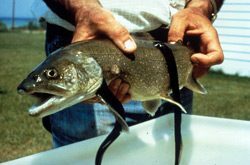 Superior is the only place Lake Trout survive in healthy numbers. down. Part of the effort is using a chemical called TFM that kills the lamprey. young lamprey as they swim down into the lake. spawn, or lay new eggs. Scientists suspected the larvae might play a role in the spawning migration of adults. Great Lakes. The question is, how much would he need? eggs, and once they’ve done that, they die. lamprey and add a new weapon to their arsenal. hoping they can use the pheromone to draw the lamprey to traps further upstream.